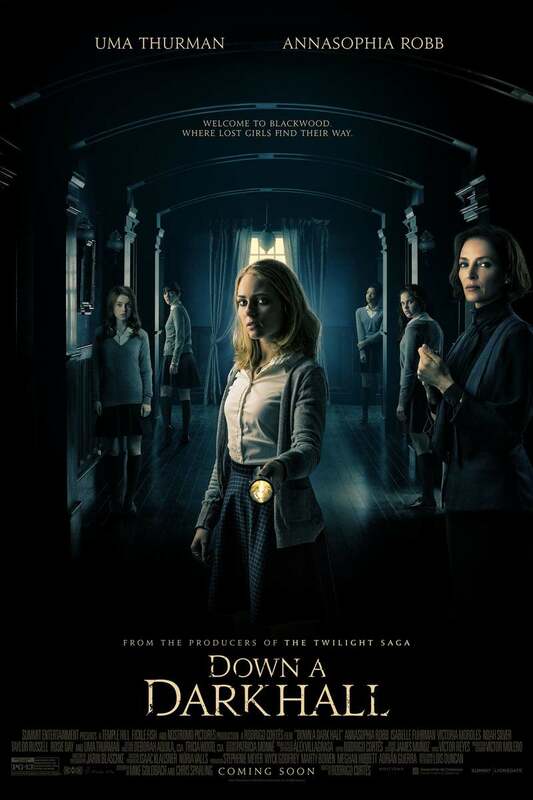 Down a Dark Hall DVD and Blu-ray release date was set for October 16, 2018 and available on Digital HD from Amazon Video and iTunes on October 16, 2018. Katherine Gordy, who goes by the nickname Kit, starts down a dark path after the death of her father. With a misdemeanor arrest and two school suspensions in her past, no one is willing to believe in her innocence when she's accused of arson. Her mother Ginny and step-father Dave don't know what to do with her. When a member of a mysterious, exclusive academy, the Blackwood Boarding School, approaches the family with a reeducation plan, Ginny accepts the offer on behalf of Kit. Yet Blackwood isn't the great school advertised to the family. Kit finds herself in a gloomy, old mansion with a handful of other misfit girls. The staff immediately takes away their cell phones and tells them that the school is their alternative to prison. To their horror, Kit and her new roommates all too soon discover that Blackwood holds dark secrets and that the staff had no intention of helping the girls. Instead, they're nothing more than tools in an experiment that's certain to end their lives.